For over 40 years, we at Martin Avenue Pharmacy, Inc. have been committed to bringing you the very best professional quality and service. We are a full service, custom compounding pharmacy in Naperville Illinois, and our customers have come to us for years to have their prescriptions filled and to chat with their pharmacists. Despite our ever-increasing technology, we have not become a mail order mill or a chain store. We know our customers by name and try to give each individual the personal attention they deserve. We’ll do that for you, too. We offer a multitude of services so that you can find information, products and solutions. PHARMACIST-IN-CHARGE: Roopinder Ahluwalia, Pharm D. A.C.A. : American College of Apothecaries, Elected Fellow into Academy 1994 to Present, only two percent of Pharmacists are Selected to Join. 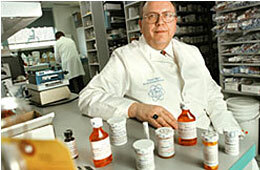 PCCA: Professional Compounding Centers of America (1985 to Present) Selected to join.